Monday afternoon, October 29, I pick up my lifelong friends Erica and Harold Van Pelt on the way to LAX and an outbound Lufthansa flight to Munich. We have time together to catch up on many things, including our excitement of seeing the special exhibit of gems and minerals from the “roof of the world”—the Himalayan mountains: Afghanistan, Pakistan, and Nepal. This will be the 44th annual Munich Mineralientage. I applaud Johannes Keilmann, his lovely family, and his great staff for putting on the finest and largest mineral and gem show in Europe. What a great effort—and it shows. I remember from the mid 1970s a much smaller show (albeit a very charming one). I have visited the Munich show more than 30 times. The Hotel Seibel and the Krone are in downtown Munich and still house many of the collectors/dealers of the Munich show so I stay here and commute by U-bahn. Simple and efficient, the underground goes right to the Messe (fair). I arrive at the show on Wednesday morning and activity is all around the three halls. Little is set up yet and I see a few of the usual suspects, many American collector and dealer friends, including Scott Wersky, Ross Lillie, Victor Yount, Mike Bergman, Andy Seibel, Bill and Carol Smith, and Barry Yampol. Each of us have friendly European dealers who hope to show us something first, but the competition is fierce and fun. I am most excited about the special exhibit but it will not start to be set up until tomorrow. I greet each dealer in the pavilion for advanced mineral specimens and get a realization of what the dollar buys at 1.44 to the euro; this time purchases must be specific and carefully negotiated. I have a large customer base and long-term relations with Munich dealers, so I am able to get a few fine selected things in this first day. Thursday I am still hunting fine minerals and gems, but by noon I’m invited to help set up the special exhibit with a few friends contributing specimens. Kudos to Keilmann for purchasing the special cases that many of us have gone to in the Westward Look show. Custom-made anodized metal in black or (as here in Munich) white, with a myriad of fiber optic lights to highlight gems and minerals with heat-less but intense light. 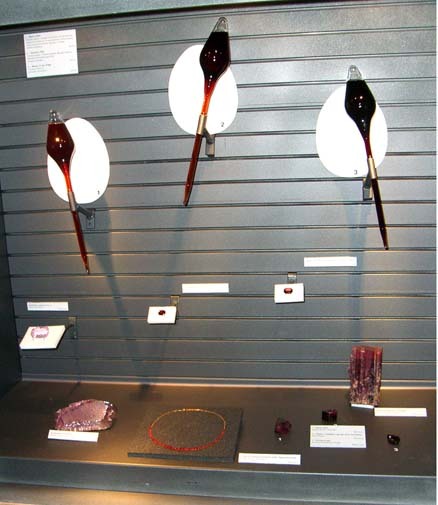 Herb Obodda is featured both in the show catalog and in the display. 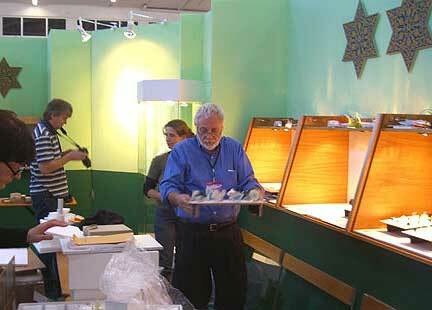 and he is busy setting up not only the collections he showed in Tucson but many more. 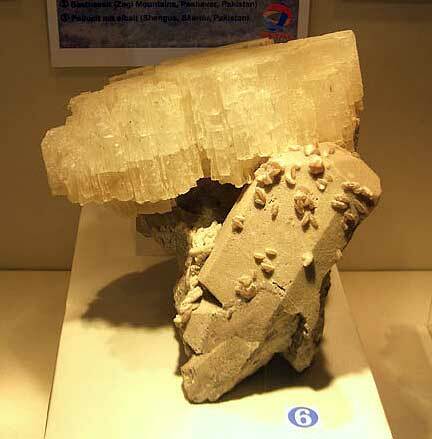 The National Museum of France has a great selection of rare minerals including the finest large beryllonite I have seen. 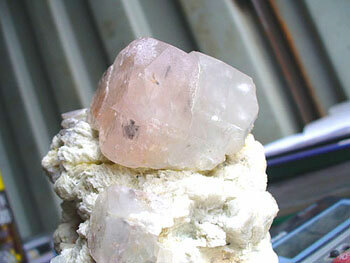 The central whitecases are being set up with minerals from various sources and the pieces are all superb. 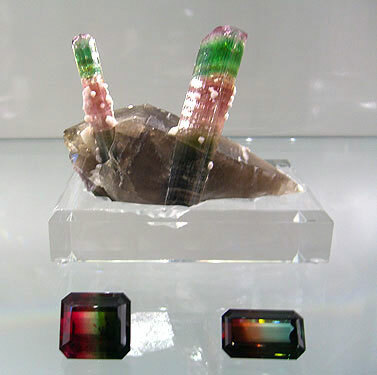 The large multi-color tourmaline in its special case is well lit, with haunting Enya music surrounding it. A special opening for the special displays starts at 6 p.m. for invited guests and this is a fun time. Also the special mineral pavilion has a dinner for invited guest and I shuttle between them both. Friday the special cases are now finished, and this is dealer day, fun to walk and talk. 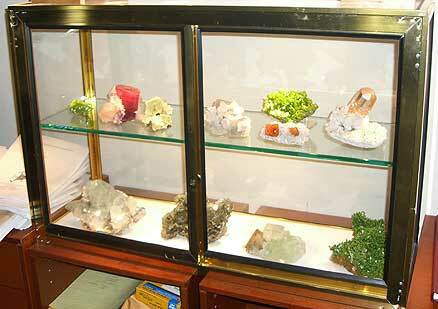 Lots of fine minerals are now set up in all the dealers’ booths. I meet up with Tom Moore, who is writing the Munich show up for The Mineralogical Record, and we compare notes on new finds—few this year, but interesting. See his column in the next issue! Saturday is the first day open to the public, and it shows: long lines and crowds to get in, and I am so appreciative I have the special guest badge. Once inside I finish my purchases and pack my items carefully. A few offers are accepted and my show is a great success. Museum booklet cover highlighting the 3.7-kg. 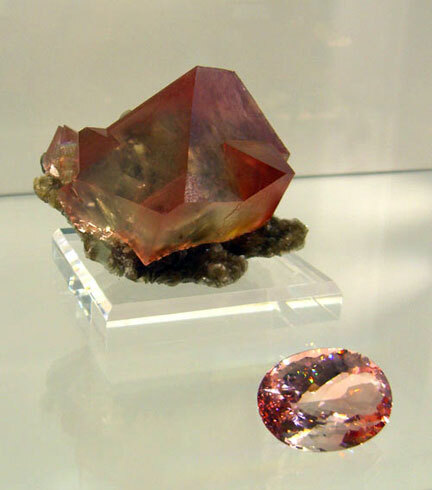 red fluorite crystal that measures 10 cm. Bonhams & Butterfields is holding its Winter Natural History sale in Los Angeles on Sunday, December 2, at 11:00 am. 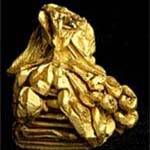 The auction includes fine fossils, minerals, lapidary works of art, meteorites, amber, jewelry, and gemstones. For information on the sale, visit Bonhams and Butterfields. At the upcoming 54th Annual Tucson Gem and Mineral Show in February we will revisit the great mineral localities found with the U.S. borders. 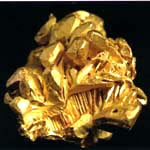 Highlighted in “Minerals of the U.S.A.” will be some of the great finds, as well as the people involved with the mining. The main display cases will be filled with some of the classic specimens found right here at home. We picked up this calendar at the Denver show in September. 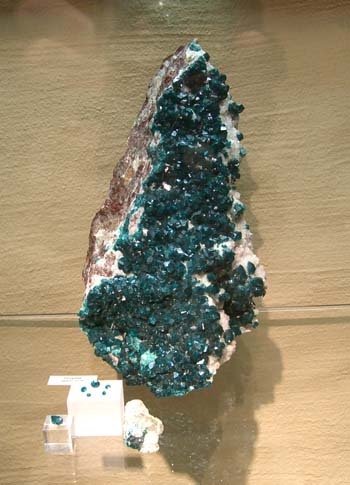 This month we feature an exquisite dioptase and quartz specimen from the Tsumeb mine in Namibia. A delightfully sparkly piece with a larger version of drusy quartz coating the surface; individual crystals measuring about 3 to 4 mm. 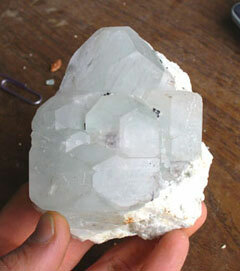 The little quartz crystals overlay a thin layer of dioptase, which can be seen from the back. At first glance the clear quartz crystals seem to have a soft green background, but when you use transmitted light the piece glows vivid green. 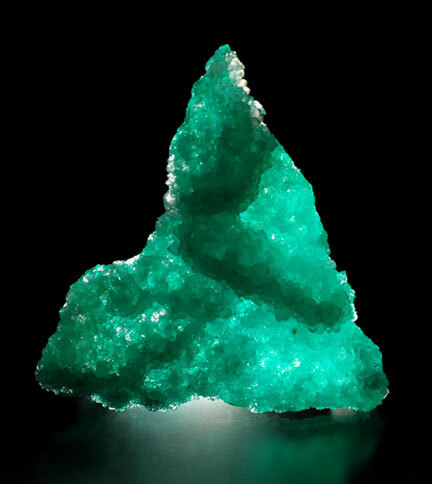 The dioptase-laden back side brings out a different character when backlit, as seen below. 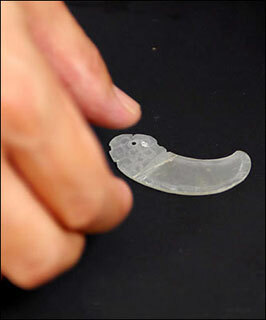 The morphology of the underside seems to be a cast of some sort, creating the undulating surface. The growth of Palagems.com has created increased traffic through our web pages. 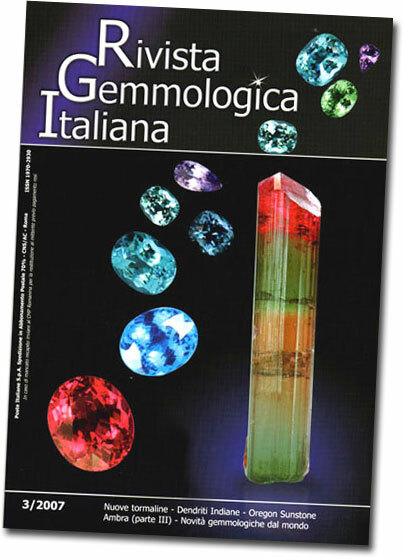 The brilliant and vivid pictures seem to attract gem and mineral enthusiasts, from the novice collector to the scientific researcher. 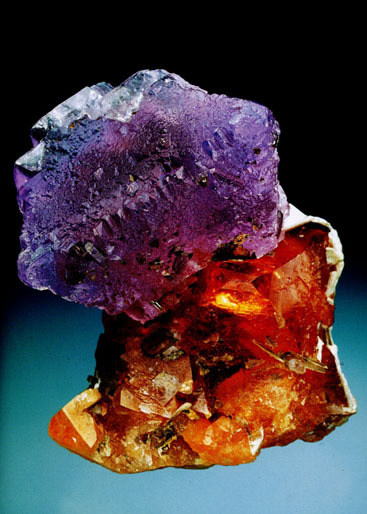 These advanced studies into physical and chemical analyses of unique minerals and gems produce important findings (and accompanying graphs and tables) relating to the composition and the elements that produce unique and electrifying colors. The authors also look for appealing images to complement their rigorous studies. 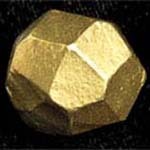 Hard work on the scientific side seems to be well balanced when you can show a beautiful picture of a gem that is born of these unique geological and chemical conditions. From the invitation to last week’s opening of the Wertz Gallery. 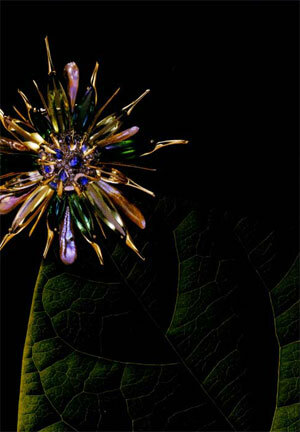 Sunflower Brooch by Nicholas Varney. 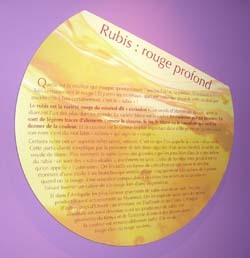 signature exhibit area dedicated to gems, the crystals from which they come, and jewelry comprised of these precious stones. 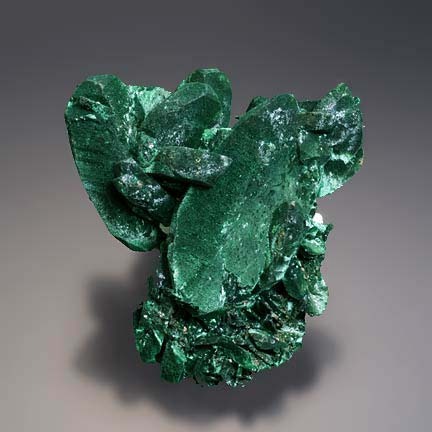 … Exhibits in Hillman Hall present minerals in the manner of sculpture, shown for their beauty as well as for their physical properties and economic uses. … Approximately 500 gems, crystals, jewelry and other pieces of gem art will be on display in the permanent collection of Wertz Gallery. In this edition of Mineral News we feature a velvety malachite after azurite specimen with a big bladey crystal and intricate secondary clusters. 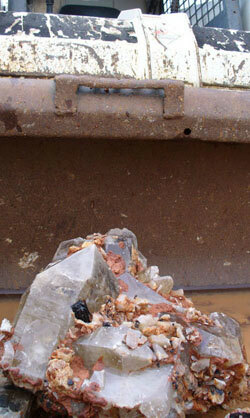 This material has reportedly been pulled out of the ground in the last year. 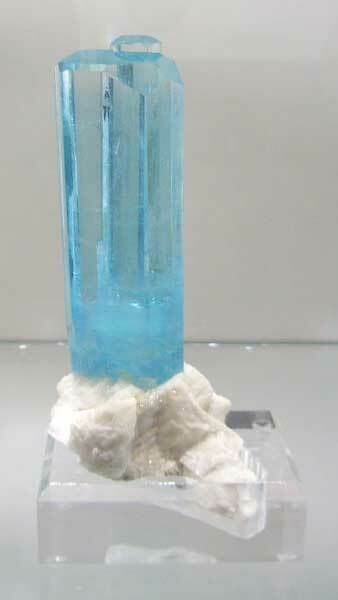 This piece is said to be one of the best specimens from the new discovery in Chihuahua, Mexico. 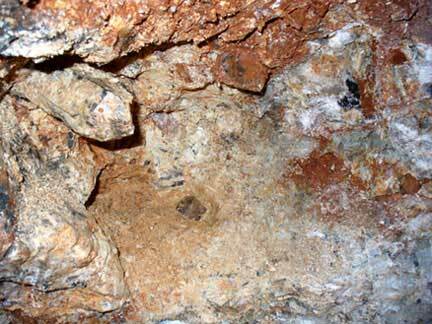 The quality of the new find has been compared to the material found in Arizona, from the Tiger Mine, and Namibia from the Tsumeb Mine. The true classification of this deposit is still being qualified amongst the great finds in Arizona and Namibia, but the specimens are definitely a refreshing sight. The malachite takes on a velvet luster and has a sheen that moves like a chatoyant gem. This new find of malachite pseudomorphs from Mexico seemed to be the only new find that was producing any noteworthy specimens at the show last month in Denver. A meteorite landed in a remote region of Peru near the town of Carancas, Puno Region, the night of September 15. The UFO was seen plummeting to Earth in the southern Andean region of Peru near the Bolivian border. 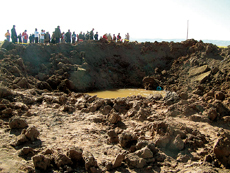 The crater made by the object was 30 m. (98 ft.) wide and 6 m. (20 ft.) deep. Scientists have not been able to determine exactly what the foreign object is composed of, but concerns have grown after many visitors to scene have complained of headaches, vomiting, and nausea after inhaling gases around the crater. Reasons for these symptoms have been reported as reactions to sulfur and arsenic fumes released from the ground, and simply overreactions by the onlookers caught up in the mass hysteria and anxiety caused by the media frenzy. 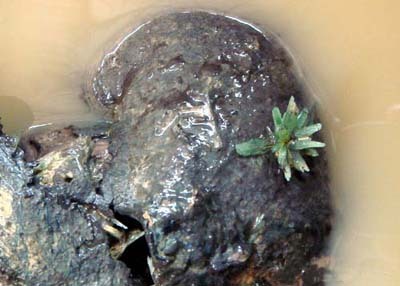 Chinese archeologists discovered several pieces of an unidentified green crystal growing on bones in a 2,500-year-old tomb in the southeastern province of Jiangxi, according to the official Xinhua News Agency. 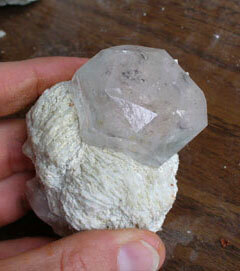 Previous discoveries of white crystal formations in tombs were determined to be crystallized amino acids. The tomb is believed to date back to the Eastern Zhou Dynasty, which spanned roughly 500 years beginning in 770 B.C.E. The coffins and contents were extremely well preserved. The main coffin, which weighed over a ton, included “a round, exquisitely made piece of gold foil as well as a jade pendant in the shape of a dragon,” according to the article. 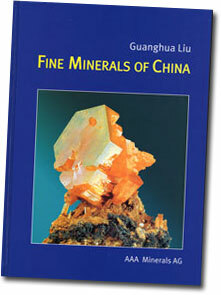 In our premier issue of Mineral News last year, we mentioned a new book by Dr. Guanghua Liu, Fine Minerals of China. At last month’s show in Denver we finally laid our hands on it—and it was worth the wait. 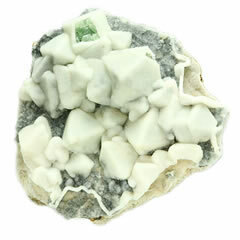 Fine Mineral of China encapsulates the diverse and widespread mineral deposits of China into a well-categorized encyclopedia of data. Part One includes historical discussions of China’s physical and political geography, and the fluctuations in mining technology. The book also describes the geologic history and follows the major tectonic events that created some of today’s large ore deposits. The history of mining is traced back over two millennia, and up through the modern age of the mineral specimen business. Guanghua Liu’s book takes notice of the differences between the Western type of scientific collecting and the Chinese search for the artistry in nature’s sculptures. The Chinese seem to value aesthetic form and suggestive imagery while the West places value on crystal perfection, minimal human intervention, and precise locality. 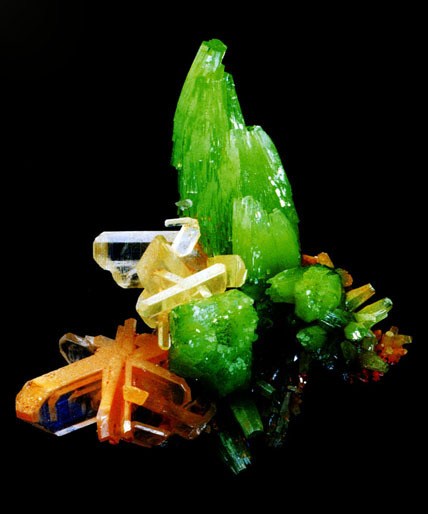 The core of the book—Part Two—focuses on 45 of China’s greatest mineral localities with detailed maps and vivid photos. 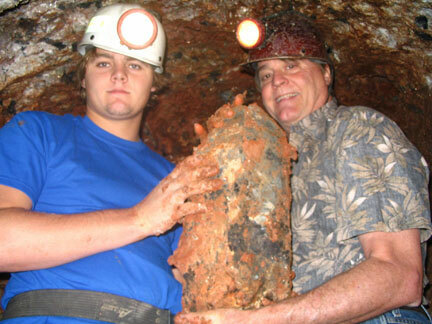 Sections are broken down by province and deposits within the provinces are described by location, general interest, mining history, accessibility, and major collectible minerals. Part Three entails data compilation with tables by mineral locality, species, and an interesting record of meteorite falls dating back to 2133 B.C.E. A mountain of minerals. 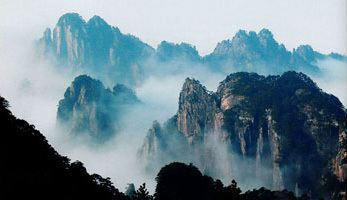 Mount Huang, Anhui Province (page 26). 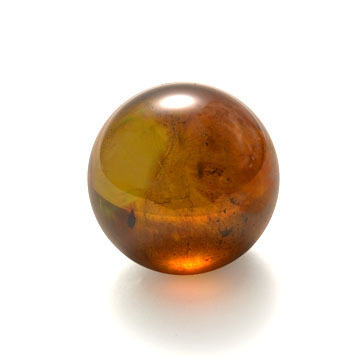 If you happen to be in Germany this year, try to catch this exhibition: “Gemstone Treasures from Namibia,” which includes mineral specimens and faceted gemstones. 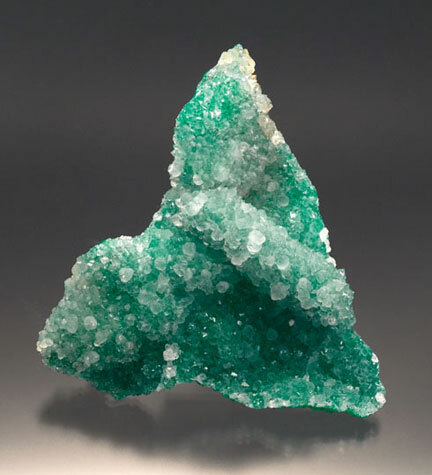 Featured in the exhibit are diamonds from Lüderitz, green beryl from the Rossing Mountains, aquamarines from the Erongo Valley, tourmalines from Karibib, and cuprites from Onganya. As Bill Larson was jet-setting around Europe in July, he was able to see this extraordinary exhibit. 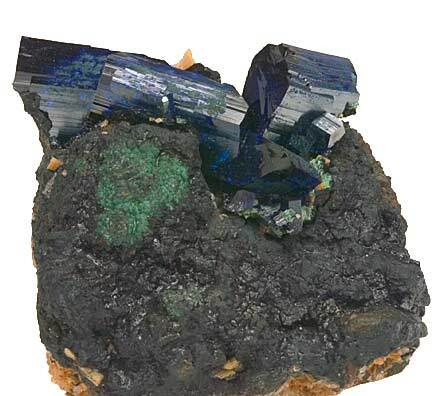 He even managed to capture a photo of a dioptase specimen that landed on the pages of the new edition of Namibia: Minerals and Localities, reviewed below. (If you can’t make it over to Germany, this book is probably the next best thing.) See more show details at Deutsches Edelstein Museum. 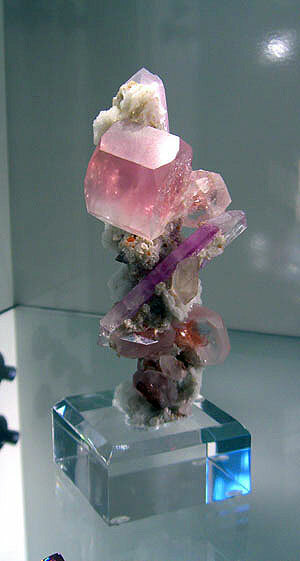 Sainte-Marie is still my favorite show for minerals. The fact that it’s set up like a street fair, with a party atmosphere, combined with the great local cuisine (foie gras on every menu) and the wonderful local Alsace wines (chilled pinot noir rouge) makes this a hard act to compete with. The show is split into two areas: the original area with 650 dealers from 60 countries, and a newer area about one kilometer away featuring gemstones, jewelry, and beads with another 300 international dealers. A small tourism “train” shuttled between the two shows at regular intervals. This year’s show had a few important changes. Michel Schwab continued to upgrade the “theatre” area (local landmarks house both dealer booths and exhibitions). 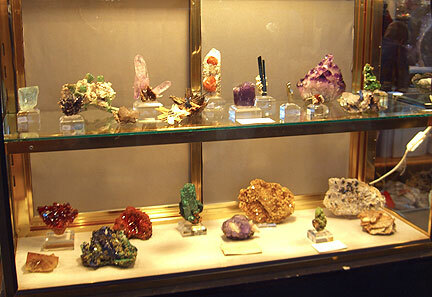 Fewer, but finer, displays from the dealers, which were included there, make this area of the show more sophisticated—somewhat like the Munich show’s special dealer area, where the best minerals are shown. Two other enclosed buildings were filled with dealers set up along tables like in years past in the theatre. 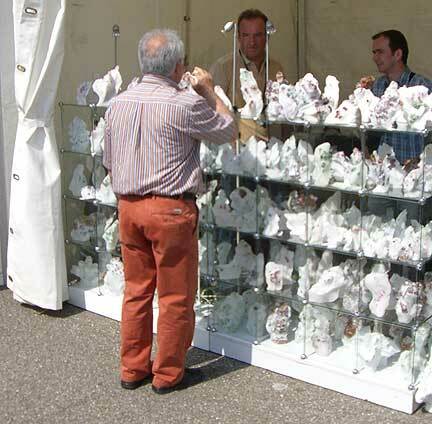 Many dealers come from all over the world with minerals, fossils, and meteorites. For collectors like myself, there are even a few book dealers. There are also special displays set up for the public. This year’s display featured minerals with a spherical shape. I was amazed so many species could form this way. This year there were few new mineral finds; however, there was a new find of siderite. 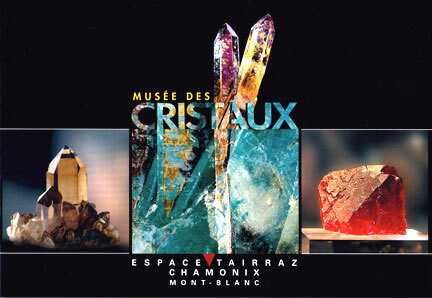 These were large lustrous crystal groups, some with quartz, from Saint-Pierre-de-Mésage, Isère, in eastern France. 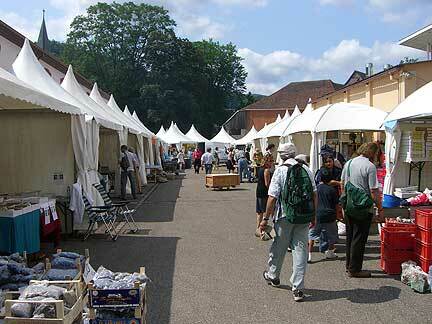 They were similar to the famous ones found at the classic locality of Allevard-les-Bains, also in Isère. About forty excellent pieces were recovered, the finest going to the French National Museum of Natural History, and the rest sold out to a few French dealer/collectors in the first setup day. 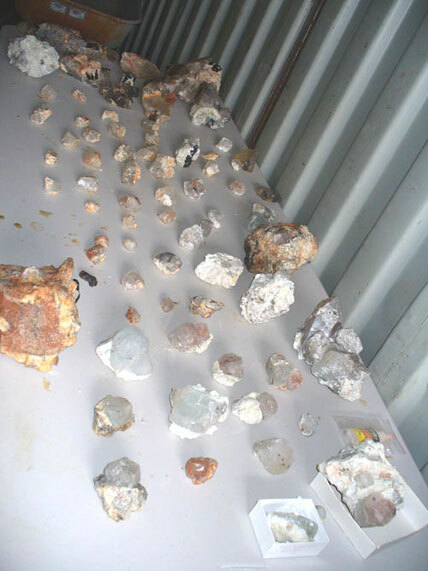 Other interesting finds were some new rutiles from Kipushi, in southern D.R. Congo, the best of which looked similar to cyclic twins from Magnet Cove, and some small but beautiful gem quality titanites (sphene) on matrix from Imilchil, in central Morocco. These later titanite pieces could be world class if the locality is worked more and luck is with the miners to produce larger pockets. 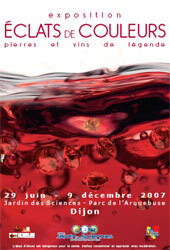 The Sainte-Marie show for 2008 is featuring special displays of “watermelon” slices of tourmaline, from private collections, and is sure to be a great event. 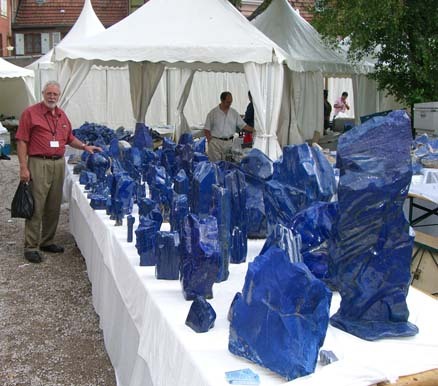 Last month, Bill Larson attended “Flashes of Colour: Stones and Wines of Legend,” an exhibition in Dijon, France, featuring Pala International gems and mineral specimens. The show is produced in partnership with the French National Museum of Natural History and the Interprofessional Bureau for Burgundy Wines, as well as the Jules Guyot Institute (a winemaking school) and the UNESCO Chair of Wines and Culture (a cultural and scientific networking body). “Travel addicted gemologist” Vincent Pardieu, whose photographs have graced our newsletters, read about the show in Le Règne Minéral, and had the following to say in relation to gemstones and wine. It seems that you will be soon “chevalier de l’ordre Tastevin.” That’s great and as grandson [of] a French wine maker (you know now the origin of my given name) I wanted to congratulate you about it! I found the idea of that expo great as regarding colored gemstone marketing. I feel that the gem trade could learn a lot from what was done in the wine trade: In both cases these are products from the ground, there are multiple small producers, and there are treatments—“sugar diffusion” for Champagne and “heat treatment” for Cognac, Armagnac and even Porto wine. Anyway, they were able to find ways to protect their names and give their product some quality image. The show continues through December 9, 2007. Read more here (in French). In this edition of Mineral News we feature an azurite cluster on matrix. 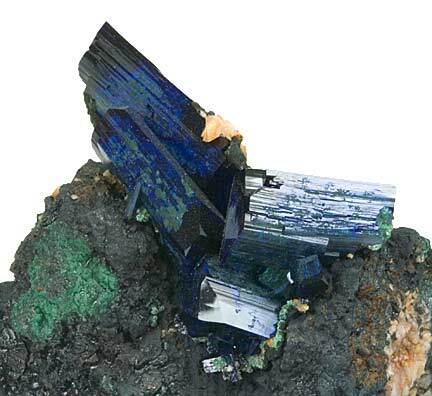 This dramatic specimen consists of four interlocking azurite crystals atop a dark black and green host. The azurite crystals are well formed blades with nice glassy terminations and sleek striated sides. 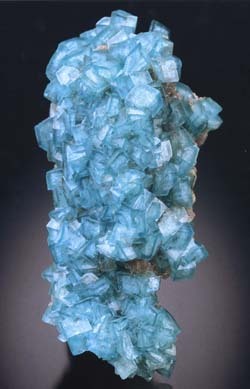 The crystals have a blotchy dark blue-to-greenish blue exterior, with some electric blue translucency. The largest azurite crystal measures 33 x 20 x 9 mm. This mineral oddity captured Bill Larson’s esoteric eye at last month’s Sainte-Marie show—although even the layman can appreciate its subtle beauty. 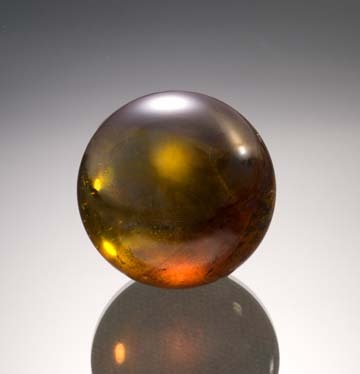 In transmitted light we see a rich amber–honey color with only a few inclusions. Overhead light reveals the metallic luster in a silvery skin. 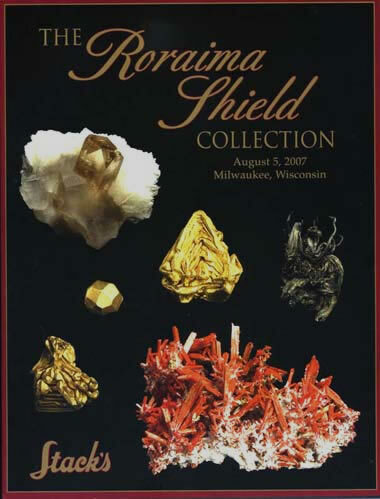 The Roraima Shield Collection consists of 61 mineral specimens and 22 native gold crystals, assembled by the team of Roger LaRochelle and the late Jack Carlson. A beautiful glossy 64-page catalog (below) was put together by Stack’s to showcase the collection prior to its upcoming sale on August 5. See more details at Stack’s website. The Big Four—amongst the finest crystalline gold, for size and form. 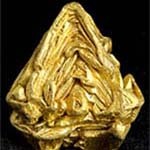 We’ve been informed that the trapezohedron at lower left has been “withdrawn for further study,” indicating that its crystalline authenticity is in doubt. The three stacked octahedra, however, all have been verified. 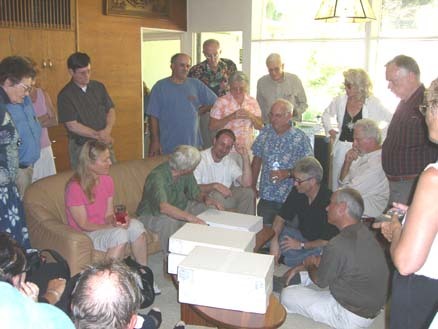 Renowned UC Berkeley mathematician and world class mineral collector Steve Smale held one of his “mineral parties” in July. His purpose? Fun and sharing his new acquisitions. 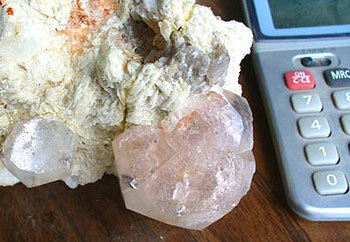 This year’s main attraction was the display of much of his famous Chinese mineral collection. Many members from the Crystal Gazers club in San Francisco were in attendance, including Jack Halpern, Jon and Nancy Sigerman and their son Max, Paul Geffner, Caroline Manchester, and Si and Ann Frazier. Many out-of-town guests also came from Dallas, including Jim and Gail Spann and Rob Lavinsky; from the Denver area, Dave Bunk, Steve Behling, and Richard Jackson; from Tucson, Ken Roberts; and from Southern California, Wayne and Dona Leicht, and Jeanne Larson and myself. Clara Smale had set up the usual beautiful buffet with a large poached salmon being a hit, along with a fine selection of many California wines. An animated, exciting time was had by all who attended. 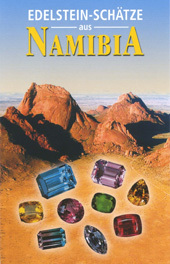 Namibia is more than a book, weighing in at 9.3 lbs., it’s everything you would ever want to know about minerals from this dramatic land, and more. This volume is an expanded version of the first edition which came out in German in 2002. A beautifully illustrated behemoth divided into two main sections: the 15 main mineral localities and the encyclopedia of minerals of Namibia from A to Z. The 850 pages and 1,600 full-color images take us on a journey from Namibia’s prospecting history through the legendary Tsumeb mine, and the famous collections and collectors that were spawned from these mineral rich lands. “Matterhorn of Namibia.” These 700-million-year-old peaks, the Greater Spitzkoppe, rise dramatically up to 700 feet above the plain. 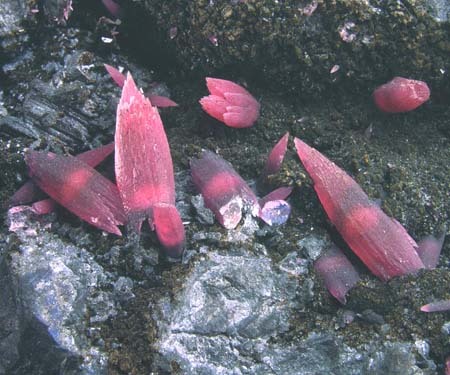 We include here some images from the book: the iconic Greater Spitzkoppe outcrop (above), near Brandberg, and some unusual colors and habits for smithsonite (below), exhibiting the strange geologic conditions and unusual chemical mixtures that have created some of the most rare and beautiful mineral specimens on the planet. 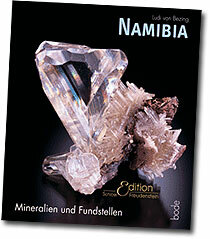 To view sample pages of Namibia visit the publisher, Bode Verlag. Mines, the magazine of the Colorado School of Mines, is now online. Now under the editorship of Nick Sutcliffe, the current issue (Spring/Summer) includes three feature articles on sustainable and renewable energy. 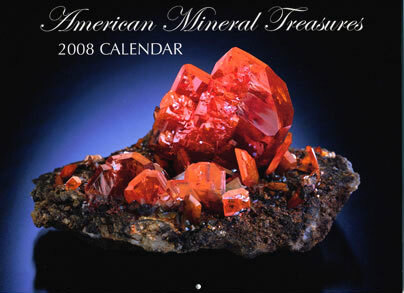 Our friend George Harlow, of the American Museum of Natural History, sent us information on publications being offered by the Mineralogical Association of Canada.